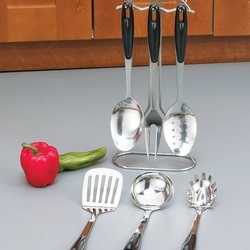 Each of these beautiful kitchen tools are constructed of surgical stainless steel. Each piece features handles with handy hang-up slots. The tools and rack are all dishwasher safe. The rack stands approximately 16" high. Lifetime Warranty. Gift boxed. Weight: 3 lbs. Spice up your life with our 15pc Cutlery Set in Wood Block. Blades feature hollow-ground fine edges with a satin finish. Bakelite™ handles feature 3 rivets and are dishwasher safe.